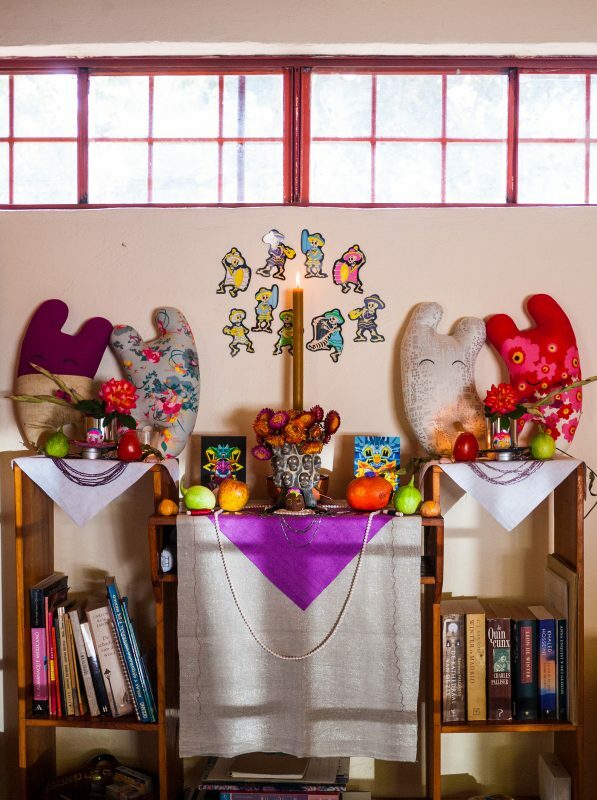 The whole altar, resting on a symmetrical bookshelf that lends itself nicely to a central portion flanked by two side altars. Home altars are set up in Mexico for Dia de los Muertos to entice departed spirits to visit and to linger. 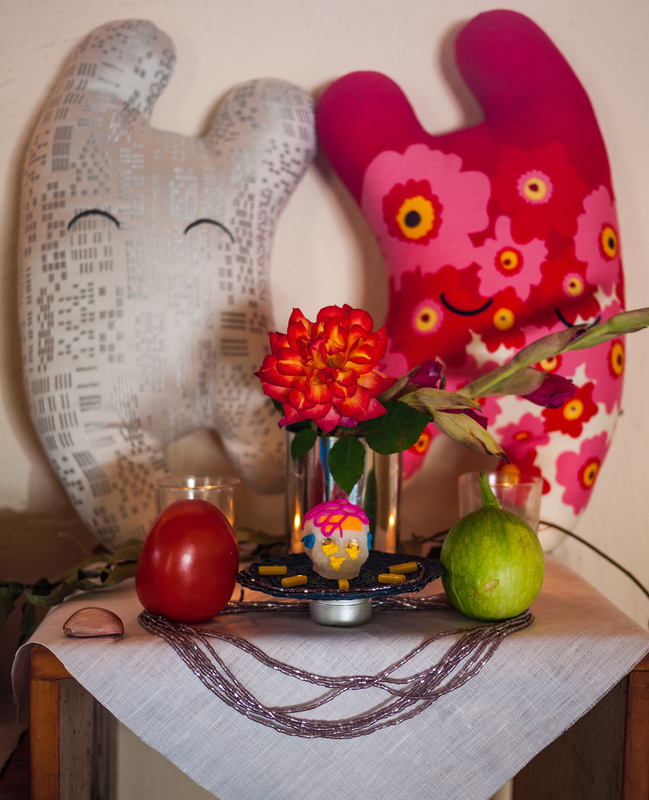 Sweets, flowers, and food are offered. We set up our altar with existing and new objects, sugar skulls and a chocolate skull, and all on pieces of silk and linen that Magda is currently using in her embroidered mandala project. 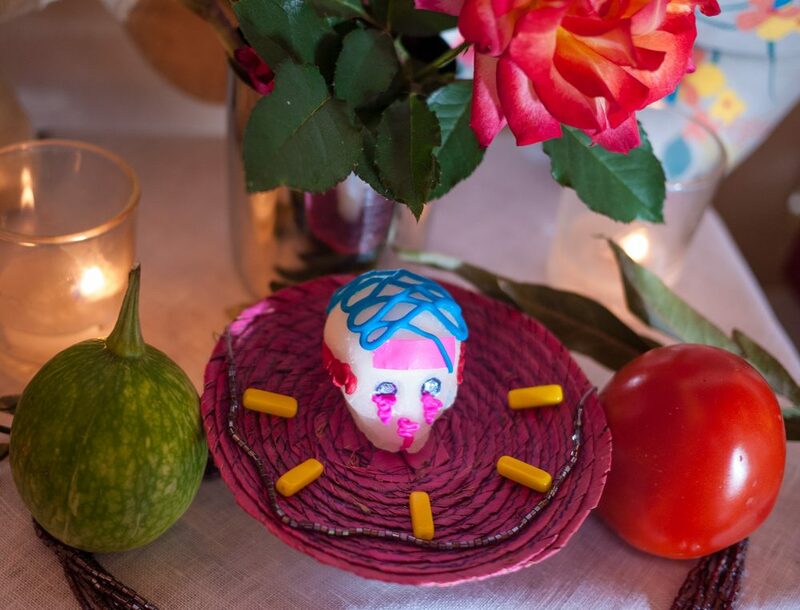 We gave our ancestors their favorite foods, art, sparkling jewels, flowers, and a merry band of skeleton musicians dancing around the central candle. 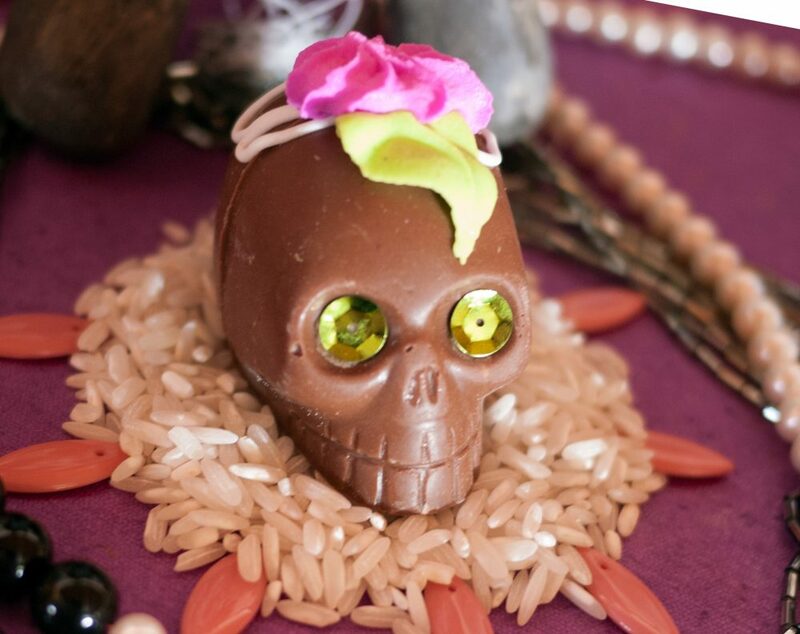 The central sugar skull is actually a chocolate skull with sugar icing and sequin eyes, on a bed of white rice. 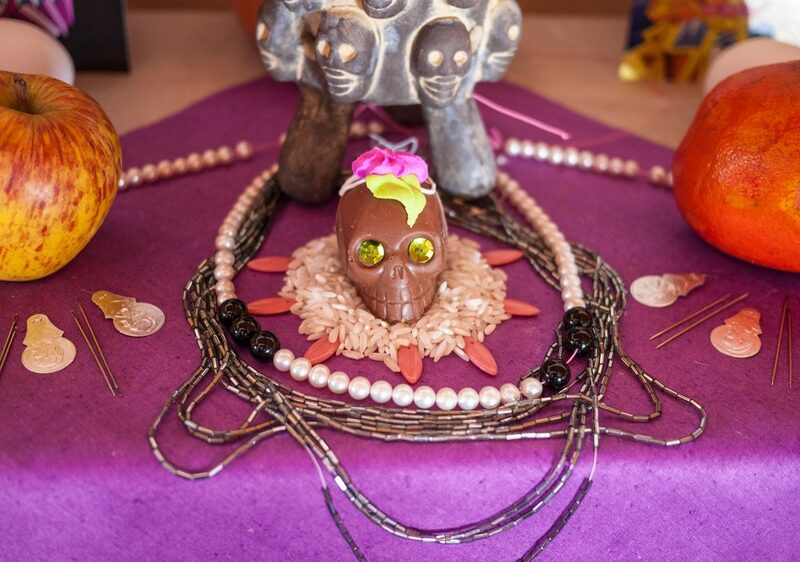 The central sugar – chocolate – skull is surrounded by rice, glass beads, and real pearls. The purple fabric is silk. 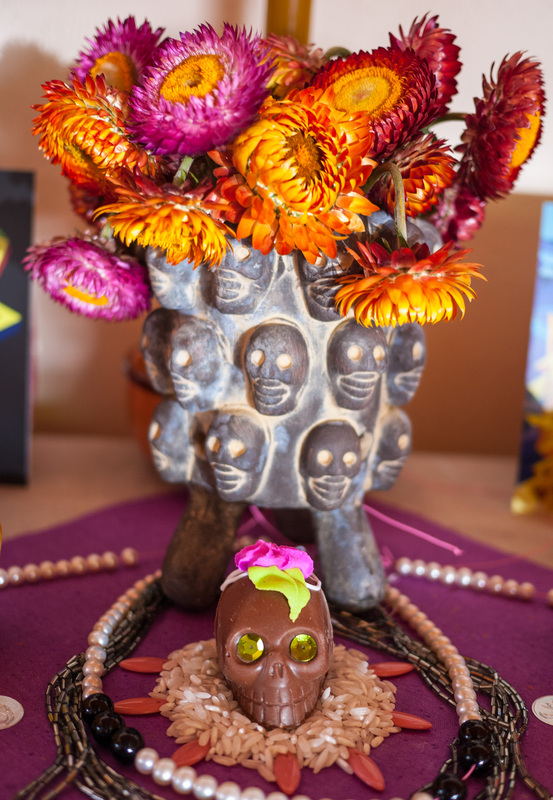 At the center of the altar is the chocolate sugar skull and a clay vase decorated with skulls that holds forever flowers. 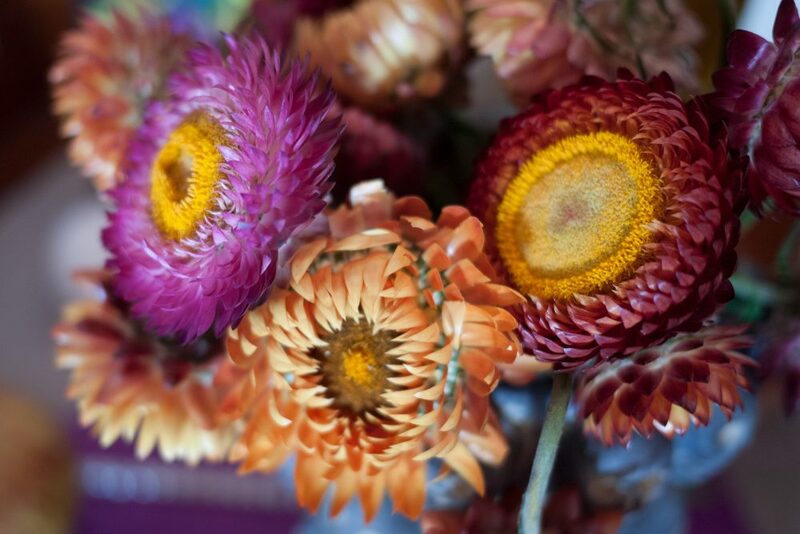 These flowers have petals like straw and retain their color when dried. 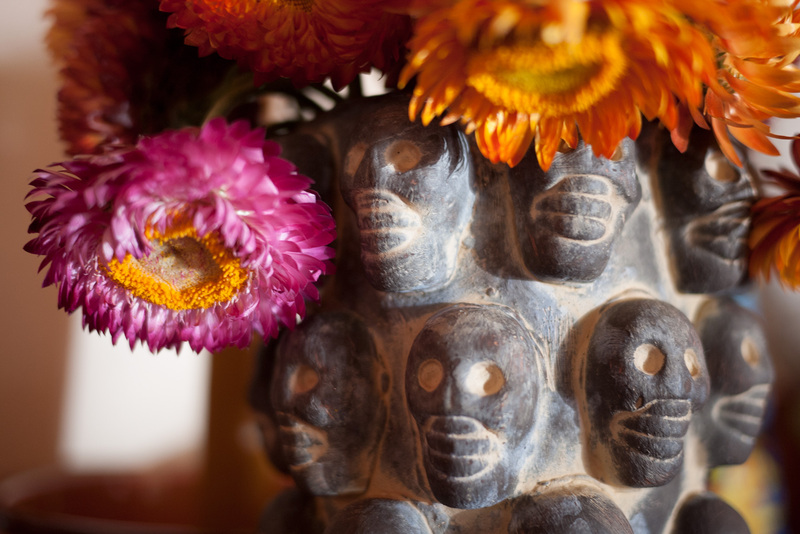 Detail of the vase covered in skulls. 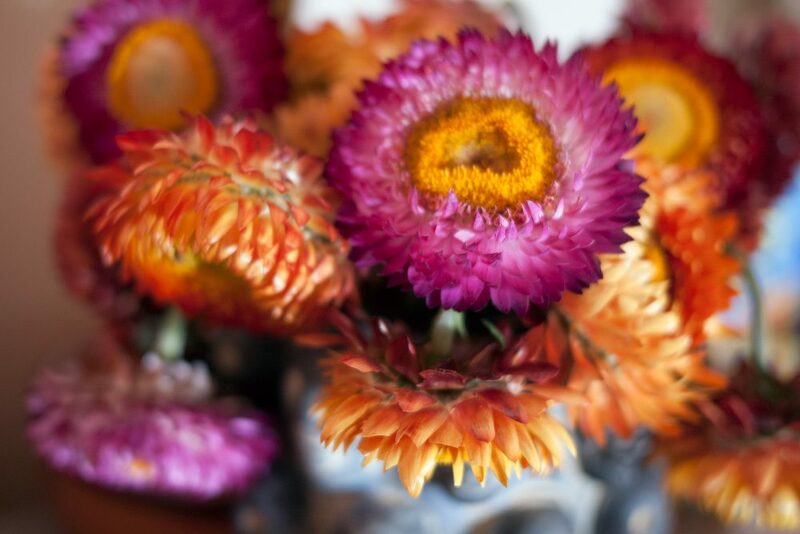 Forever flowers and their straw like petals. Closeup of the side altar on the left. 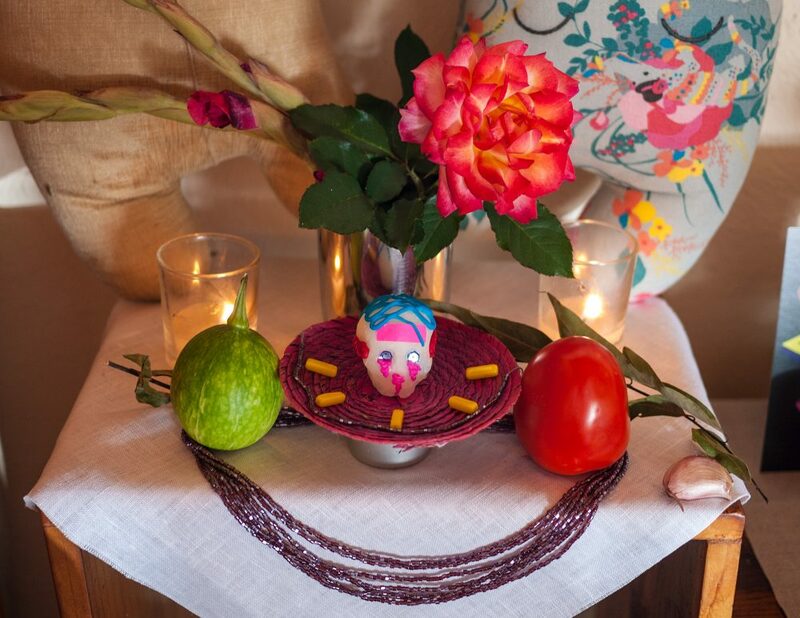 Flowers, fruit, glass beads, garlic, and a sugar skull. Made from sugar, icing, and sequins. Closeup on one of the two tiny sugar skulls from Mexico City that are on the side altars on each side. 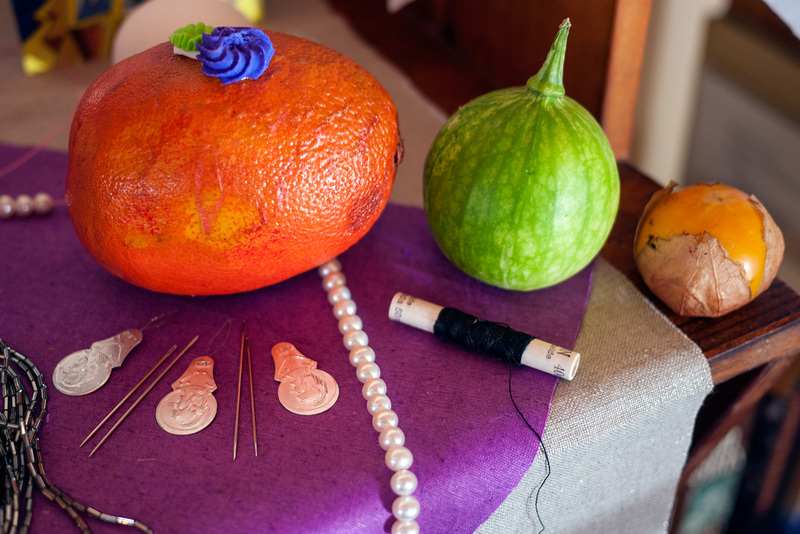 Fruit, vegetables, pearls, and sewing implements as offerings on the central portion of the altar. 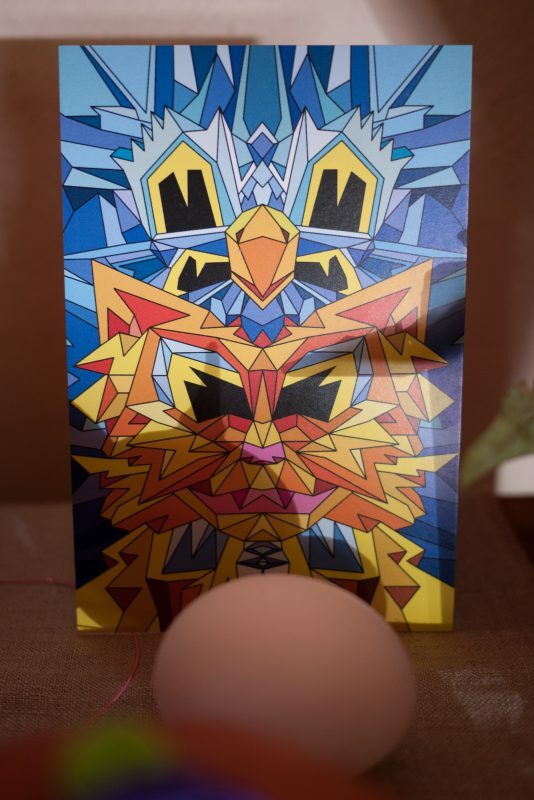 In the back on the right side of the central portion of the altar is Crystal King Firecat, with an offering of an egg. 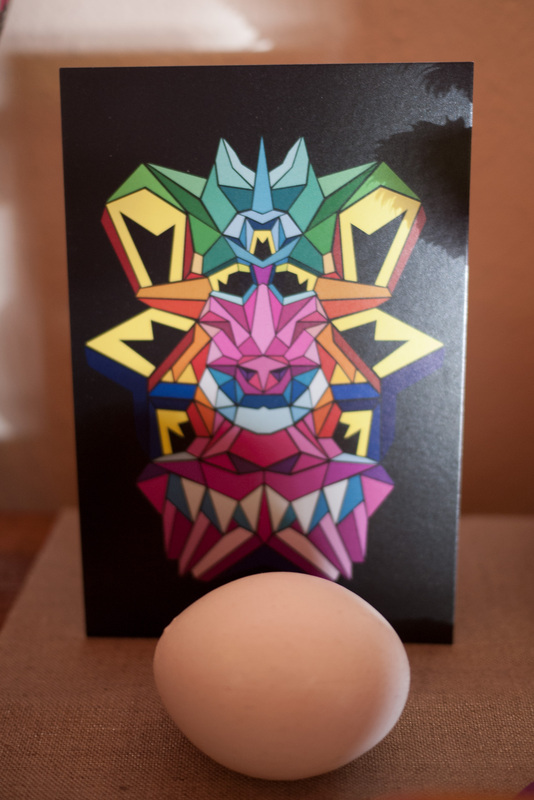 In the back on the left side of the central portion of the altar is Crystal King Ape, with an offering of an egg. 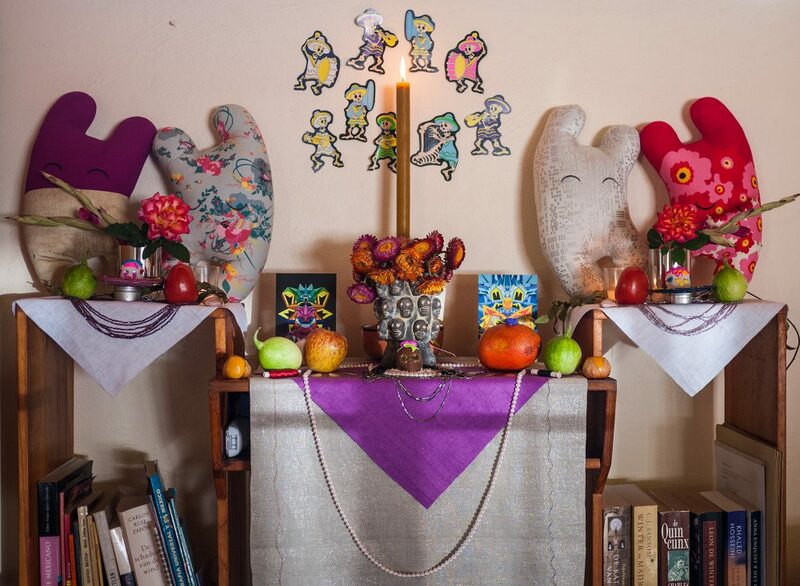 The whole altar on the bookshelf.